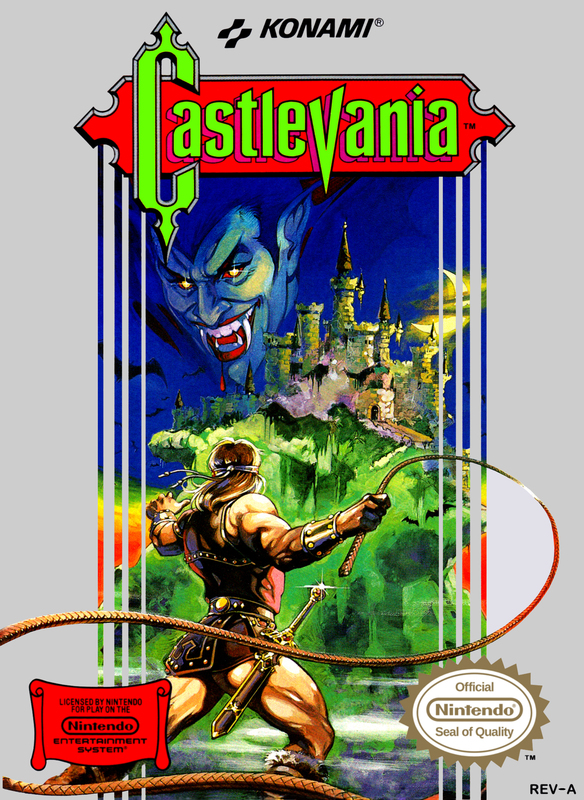 [Review] Castlevania – I ❤ Old Games! 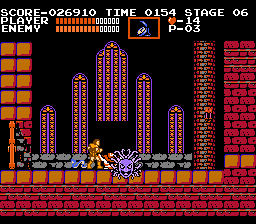 Despite being one of the most famous franchise of all time, I’m new to the Castlevania universe (shame on me), since I played the first time on my NES Mini. However I tried to behave like it were 1986 and like I were a young boy playing it for the first time on NES. 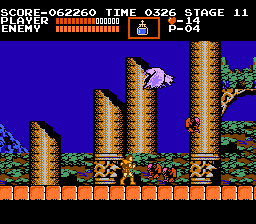 Well, this trick actually proved to be right and I enjoyed Castlevania more than I thought it was possible. I have to say that be in Simon Belmont shoes is kinda groovy! A small trivia related to this game: when it came out in the US, on May 1st, 1987 it was also the 90th anniversary of Bram Stoker’s Dracula. Not a coincidence! There one thing the NES doesn’t have but the original Famicon do have: The intro screen where the player can insert his name to save his progress. 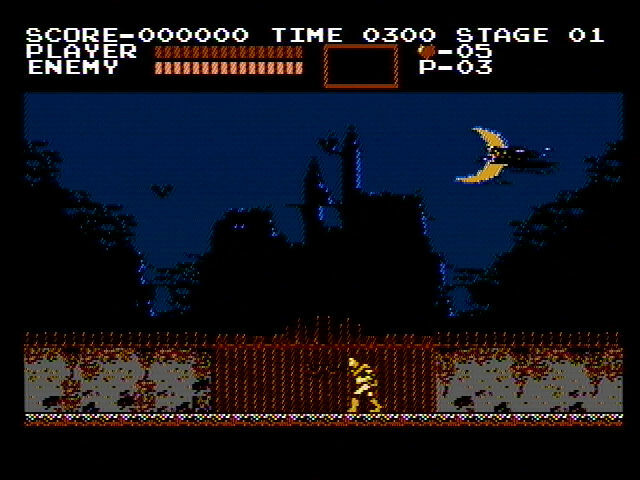 However, after the main screen which is a reprise of the cartridge cover, we are introduced to the story when we see Simon Belmont walking in front of Dracula’s castle with a classic horror soundtrack. To see the pinnacles of the manor in the distance sets you immediately in the right mood for the game. If Nintendo took over the console market in the late 80s there’s a reason. The graphics were light years better that the competitors and even a game like this, where the atmosphere should be gloomy, shines bright with its bright colors. Sometimes we see a bit of flickering when a sprite passes in front of another one but I think this is a common issue in 8-bit consoles; moreover this do not affect the gameplay so there’s nothing to worry about. 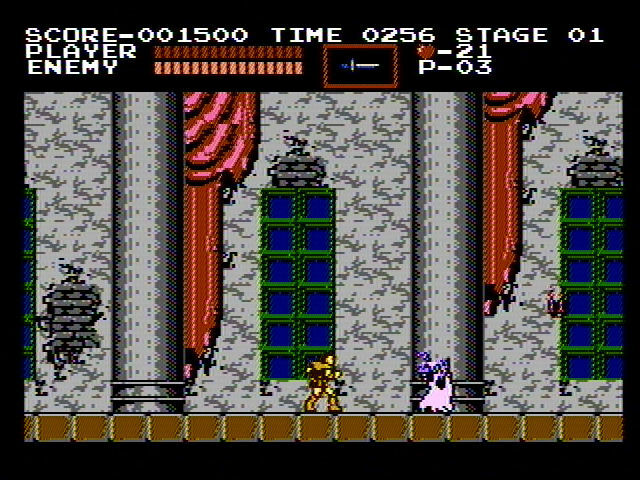 The story of Castlevania is based on the legend of Dracula. We’re in 1691 Simon Belmont, helped by his loyal whip Vampire Killer, part of the family from generations, is fighting Dracula, back to life after 100 years and his evil forces, arisen from the shadows. In order to do this, Simon enters the Count’s castle to defeat his evil forces and finally kill the Vampire. No women in trouble here, just the old war between good and evil. Simon’s base weapon it’s a whip that can be upgraded twice into a sort of morning star. 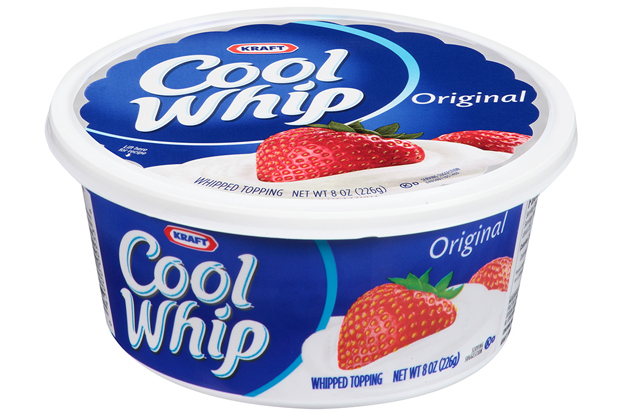 So, it’s a cool whip! Whipping the candlesticks, Simon will find other weapons, such as axes, daggers and flamable potions, a useful power-up that is capable to stop the time for a few seconds or other bonuses such as different bag of coins, small and large hearts. The hearts are very important in the game because their number influences the number of times Simon can use the secondary weapon: every heart a hit. The small hearts count as 1, while the big ones count as 5 small. As in all the platformers, at the end of each level you’ll find a boss: a vampire, a medusa head, two mummies, Frankenstein himself and in the very end the Count himself. Obviously the final bosses have more HP so it will be more difficult to defeat, but if you use some tricks everything will be easier: for example the first boss, the bat, can be defeated wth less efforts throwing axes to him and stayting in the bottom right part of the screen (remember to take the power up that enable to strick twice with the secondary weapon); Medusa head is easier to kill stopping the time, while the two mummies in 3rd level are, in my opinion, the most stupid since can be killed with the whip just staying crouched on the lower block on the left, preventing them to walk on or throwing their smelly bandages. The sound department in Catelvania is simply awesome. Maybe I say this for my endless love for hte 8-bit era sounds, but the background music we can hear in every level is something to remember. There are not so many sound effects, except the whip crack (and it’s a cool whip!) but apart from this in my opinion the best part of the game is the frst level (maybe because is the one I played the most), in which the soundtrack is at its best. Castlevania features 18 different scenarios, divided in 6 levels so if you look at the mere numbers is not a long game. Moreover the first 2-3 levels are rather easy, except some tricky moments in which is most likely to die. Simon has three lives and an health bar that let him tolerate various different attacks before dying. Every 30k points an extralife is added to the count (if you play carefully you can earn it between stages 5 and 6) and the positive thing (even if is not so positive for the longevity) is that when Simon loses all his lives the game can be resumed from the beginning of the actual level, for an unlimited number of times. This makes possible for a patient player to virtually beat the game in one day, continuing to try and advance slowly level by level. However I’ve never tried this approach with the game, since I prefer the “raw” play, the one in which when you die, you’re definitely DEAD. Pingback: [Editorial] Guess what’s next on I ❤ Old Games! – 29/10/17 – I ❤ Old Games! Pingback: [Review] Shadow Warriors a.k.a. Ninja Gaiden (NES) – I ❤ Old Games! Pingback: [Editorial] Guess what’s next on I ❤ Old Games! – 05/11/17 – I ❤ Old Games! Pingback: [Editorial] Guess what’s next on I ❤ Old Games! – 12/11/17 – I ❤ Old Games! Pingback: [Editorial] Guess what’s next on I ❤ Old Games! – 26/11/17 – I ❤ Old Games! Pingback: [Editorial] Guess what’s next on I ❤ Old Games! – 03/12/17 – I ❤ Old Games! Pingback: [Editorial] Guess what’s next on I ❤ Old Games! – 17/12/17 – I ❤ Old Games! Pingback: [Review] Super Castlevania IV – I ❤ Old Games! Pingback: [Editorial] Guess what’s next on I ❤ Old Games! – 24/12/17 – I ❤ Old Games! Pingback: [Editorial] Guess what’s next on I ❤ Old Games! – 21/01/18 – I ❤ Old Games! Pingback: [Editorial] Guess what’s next on I ❤ Old Games! – 28/01/18 – I ❤ Old Games! Pingback: [Review] Tiny Toon Adventures – I ❤ Old Games!